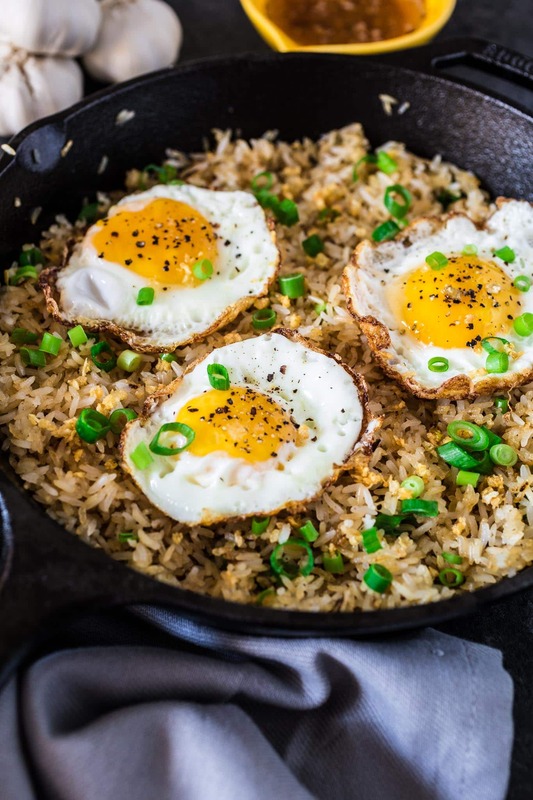 Sinangag, or Garlic Fried Rice, is a popular Filipino breakfast, often served with a fried egg on top and a drizzle of vinegar sauce. Don’t have a stomach for rice and garlic in the morning? No problem! This dish is also amazing for lunch or as a side for dinner. As I was about to start typing into the blank screen, to talk about this delicious Filipino Garlic Fried Rice, I realized that I cannot remember the last time I shared an Asian dish. I’ve recently sent out a survey to my email subscribers (I would love if you would answer it too!) and found out most of you love Asian food! I have few Asian recipes, which is pretty pitiful for a blogger who claims to share “the best of the best from around the world”. However, you’ll be happy to know that I plan on remedying that from now on, starting today with this Filipino classic! Now, as I said earlier, this dish is often served for breakfast in the Philippines. I don’t know about you, but I cannot envision myself eating garlic fried rice for breakfast. Gee, it took me a long while to start eating American style breakfast food (like eggs, bacon and sausage), because in Brazil we usually eat a lighter meal, consisting of fruits, pastries and milk/yogurt. So even though I categorized this recipe in this blog’s breakfast collection, I see it more as a side dish. I sometimes add some sorts of protein, like diced chicken or steak, and it works as a whole meal! If you’re a breakfast of champions kinda girl/guy and love rice in the morning, then by all means, enjoy your matutinal garlic fried rice! Just make sure to brush your teeth after, or that work meeting will be very interesting as nobody will wanna get close to you. ? As you can probably guess, this dish is a great way to use leftover rice. But what to do when you are craving Filipino Garlic Fried Rice but you don’t have any rice? Despair? Cry? Order takeout? None of the above! 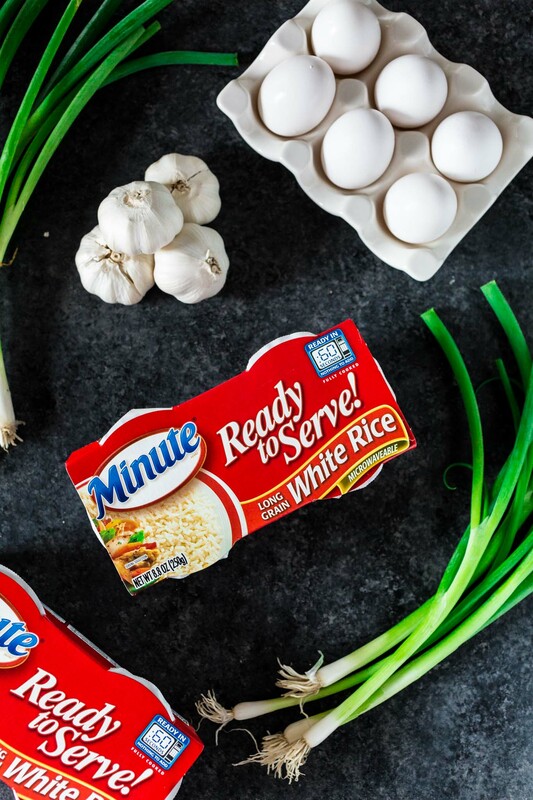 The correct answer would be: be thankful for Minute® Ready to Serve Rice. The cups cook in only 60 seconds and are great if you need a portable meal or snack. No more blaming being busy for your habit of meal skipping! If anything, you get to cook your Minute Rice Single Serve Cup, mix in your favorite ingredients and eat straight from the cup. They are available in many varieties, including White Rice, Basmati Rice, Jasmine Rice, as well as lots of delicious Whole Grain options. Check out their website to see all the varieties they have! You will notice that I’m including a recipe for a vinegar sauce, that I adapted slightly from Saveur. Do not skip it as it makes this dish even more delicious! I confess I was skeptical at first, but decided to give it a try. Just a drizzle goes a long way, and makes this garlic fried rice beyond special. Seriously, my mouth waters just by writing about it! ??? I hope you consider trying it with the sauce. Heat 1/4 cup of oil in a large skillet, over medium high heat. Add the garlic and cook until fragrant and golden, about 1 minutes. Remove a little bit of the garlic (1 tablespoon) and reserve. Add the cooked rice and cook for about 5 to 8 minutes, breaking up any large clumps, until rice is getting crispy in some places. Season with salt and pepper and transfer to a serving dish or individual plates. In that same skillet, heat the remaining oil over medium high heat. Swirl the pan to evenly coat the surface. The pan is ready when the oil becomes shimmery and very loose. 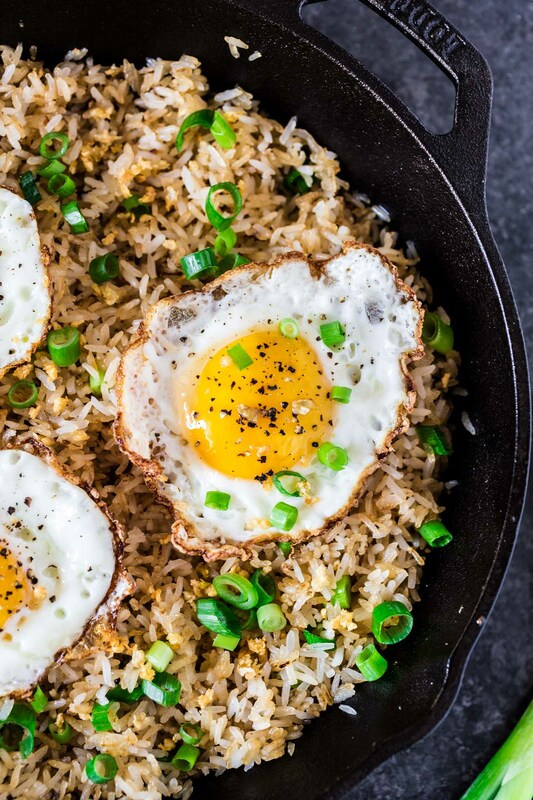 Crack each egg into a measuring cup and gently tip it into the skillet. You can crack the eggs directly into the skillet if you prefer. Cook the eggs until the whites are set and the yolks are done to your liking. Season with salt and pepper. 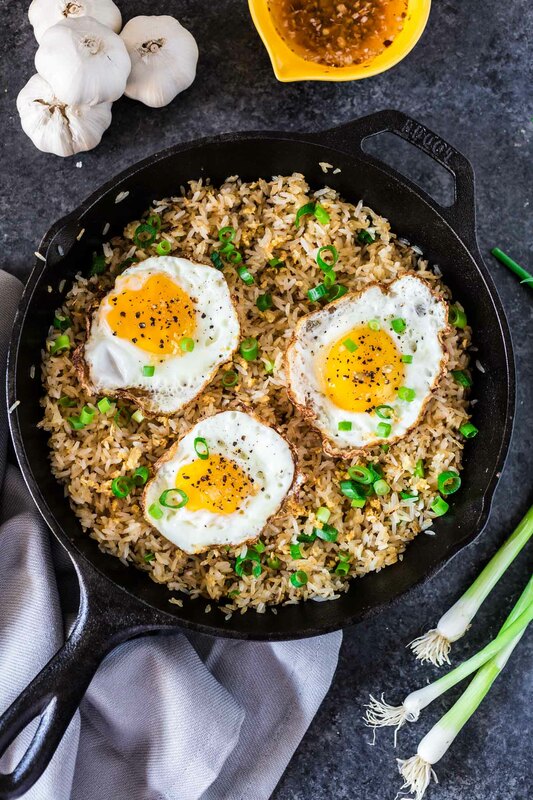 Place the eggs on top of the rice, garnish with the reserved garlic and sliced scallion and serve immediately, with the vinegar sauce on the side. Combine vinegar, chile flakes, garlic, salt, and pepper in a bowl and mix well. Reserve until ready to serve. Fried rice is always delicious, isn’t it? love the touch of garlic! Filipino dishes are really yummy. Do you have any other recipe? You have to refrigerate the rice to make fried rice properly. so the “minute rice” doesn’t save much time, really. while this may have been inspired by sinangag, this is not it. it’s an interesting take though.